If President Barack Obama is ever to take control of his foreign policy -- and move the United States into a more peaceful and pragmatic direction -- he will need to shake his obsession with secrecy and bring the American people into his confidence by sharing with them information about key events that have shaped recent crises. Right now, the American people are deeply confused about what is transpiring in the Middle East and eastern Europe -- and Obama appears satisfied that they stay that way. He doesn't seem to understand that one of the president's greatest advantages is his power to release information to the public, thus changing the narrative as written by rival political forces and forcing those forces to adjust to a more complete storyline. Instead, Obama has behaved as if he's still trying to prove to the national security establishment that he can hoard secrets as compulsively as anyone, that he's not the wild-eyed radical outsider that the Right has made him out to be. At a news conference on March 24, Obama even made a joke about his record of keeping the American people in the dark about information developed by the U.S. intelligence community. "As a general rule, I don't comment on intelligence matters in a big room full of reporters," Obama said with a smirk on his face. "And I think I'll continue that tradition." But Obama's lack of transparency -- after promising in 2008 to run a transparent administration -- has left him at the mercy of Washington's closed club of insiders, while alienating him from the broad American public. With neoconservatives and other opinion leaders dictating the dominant narrative on topic after topic, Obama has ended up reacting to events, not controlling them. Thus, even if a framework agreement on limiting Iran's nuclear program is reached, it is likely to get battered in Congress, where Israeli clout is overwhelming. The President will have to fend off repeated attempts to sabotage the deal. A more effective strategy might be for Obama to build public support by surrounding any agreement with the release of U.S. intelligence information on a range of related topics and with a blunt speech to the people explaining the need to work with major countries even when there are differences and disagreements. 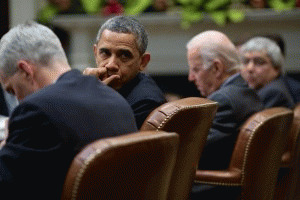 For one, Obama could provide an historical accounting of U.S. relations with Iran, including the CIA's role in ousting the democratically elected government of Mohammad Mossaddegh in 1953, the U.S. support for the autocratic Shah over the ensuing quarter century (including helping to start Iran's nuclear program), American dealings with the regime of hard-line Ayatollah Ruhollah Khomeini in the 1980s (including secret contacts between Ronald Reagan's 1980 campaign and Iranian emissaries, and the evolution of the Iran-Contra scandal), and whatever evidence exists of Iran's support for terrorism. The President also could give the American people a deeper look into the complexities of Middle East politics by exposing the role of Saudi Arabia and other Sunni-Arab states in support of Al-Qaeda and other terrorist groups. Obama has long reneged on his promise to release the 28 redacted pages of the congressional 9/11 report dealing with alleged Saudi financing of Al-Qaeda. Nothing would rally the American people to the President more than a display of candor by him and a show of faith in them. A democratic Republic cannot survive when leaders routinely hide key facts and keep the people in the dark, all the better to manipulate them with exaggerations, lies and propaganda. Obama could show that he understands that core democratic principle by making as much information available as possible. He may have forgotten but he opened his presidency with a memorandum instructing Executive Branch department heads on the importance of transparency. He wrote: "My Administration is committed to creating an unprecedented level of openness in Government. We will work together to ensure the public trust and establish a system of transparency, public participation, and collaboration. Openness will strengthen our democracy and promote efficiency and effectiveness in Government." While some sensitive data is appropriately protected for national security reasons, excessive secrecy is a form of elitism showing disdain for the many millions of us who aren't special enough to be inside the club. Secrecy also empowers an unscrupulous leader to mislead and to scare the people with selective leaks and half-truths as we saw during George W. Bush's presidency, a pattern that Obama vowed to break. But -- like much else -- Obama mostly chose continuity, not change. After a few promising document releases in the first days of his presidency, including President Bush's "torture memo" arguing the tortured legality of "enhanced interrogation techniques," Obama reversed course and turned his administration into one of the most opaque and secretive of modern times, pursuing leakers more aggressively than any previous U.S. president. In his second term, Obama has further slid into a pattern of deception embracing the Orwellian concept of "information warfare" in which propaganda themes are created and maintained even when the evidence goes in a different direction. The Syrian-Sarin gas incident is one such case when the early Assad-did-it claims were left in place despite the U.S. intelligence community's shifting analysis.